There was a recent discussion on my yahoo group about innate vs. learned behaviors. It seems the two are not so mutually exclusive. There are many behaviors we tend to chalk up to genetics and assume we can never change. But the good news is even these so called hard wired behaviors are often heavily influenced by experience. This is especially important as we work to shape the behavior of our parrots. Beni the blue throated macaw is a great example. As his photos show, he can be a love……once he gets to know you. Guess who he knows best now? Me. I spend more time with him than anyone. And all those wonderful head scratching sessions, treat fueled training times and fun play encounters make me a special person to Beni. Although I certainly enjoy this, Beni has more important things to do in his future than just be my buddy. 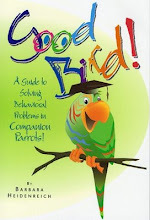 Soon he will be teaching others about responsible pet ownership and parrot conservation. This means Beni needs to play nice with others too. 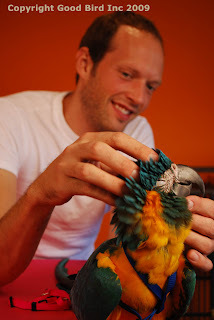 Even though parrots may have a tendency to choose one person as their preferred companion, I know that I can use positive reinforcement training to teach Beni that it is fun to interact with other people as well. Recently one of the staff members of the Kaytee Learning Center came to visit the baby parrots. This was the perfect opportunity to help both Beni and Wrigley learn that other people are also great fun. John will be the baby parrots primary trainer at Kaytee. I was very pleased to see Wrigley warm up to John right away. Within the first hour he was rolling over onto his back for play sessions and flying to John on cue. Beni on the other hand was not so sure. He did fly to John that first session, but showed body language that indicated he was not so sure about the situation. One thing that was not helping is if I was in close proximity to Beni. Because Beni can fly, if he saw me, he would often choose to come to me instead of John. While I am flattered all that great training has worked to build a strong relationship with Beni, I really want Beni to respond positively to other people. To help Beni and John succeed, I decided it would be better if I did not interact with Beni for the rest of the visit. Instead John would let Beni out of his cage, and also deliver all treats and toys. And it worked! Eventually we were able to work up to a session in which Beni enjoyed lots of head scratches from John. The goal was to reduce my value to Beni and increase John’s. It did mean I had to temporarily reduce my interactions with Beni a bit, and let John do more fun things with him. The good news is even though Beni may want to choose one person as his favorite, we can teach him he doesn’t have too. Everyone is a blast. My parrot is still very young, and is always around my parents and I. I'm having a problem training her not to bite and to have fun with my parents as well while I'm not home. What can I do? 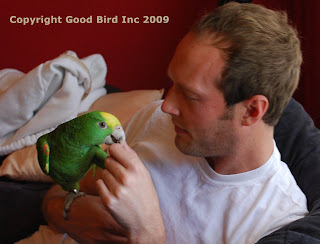 I have a 2 yr old orange winged Amazon who is truly the love of my life! I'm 62 & wanted to purchase him because he was sitting alone in a pet store & seemed desperate for attention! Because of my age, I knew he could be very alone or even homeless before he even reached middle age so I brought my 24 yr old son back to the store with me so he could meet him & agree that he would always have a home with him should something happen to me. So, together we took him home! At first he wouldn't go to anybody but me but with a lot of encouragement during the past year my son & Myakka are the best of friends. I feel so content knowing he'll always have a wonderful home within his own family with someone he knows is crazy about him! I just want to thank you for all the free info you made available for me to make an educated decision about bringing him into our family & how to get him to love my son as much as me! I'm forever grateful!! I am so glad you and your son are both able to enjoy this bird. And I love how thoughtful you were before taking the leap. Sounds like you all will add and do add so much to each other lives. Congrats! Best to you and your birds. I just got a hand raised baby hahns macaw a month ago and she is wonderful. I paln on getting some of your books but for now I would like a few tips on a couple of things. I saw how you took the time to answer all these questions. Ive been watching uoir videos for the past 3 hours. Lol. I think you are an awesome hearted person and probably love the lord also. You already have answered so many questions through your videos. I want my macaw to roll on her back, I feel tho I have already messed up bad. I got her used to being held like a drinking glass with two hands and I very gently turned her over and she did not like it. But I was thinking, I am the boss and she has to do it. I gave her some time and tried it a couple more times. I started looking up what I was doing wrong due to my fingers being sore and her now not trusting me like shee used to. I feel horihorrible and I hope I havent ruined our relationship. How do I get her to want to roll over. She is playful in her cage but while im holding her, we only spend our time with me rubbing her and stepping up and flying to me on command. I feel I am now truly understanding the the positive reinforcement only. Ive used scary objects to keep her from flying at me when I didnt tell her too. You have helped me see that I was being kinda mean and if I dont change now, she might stop being so darn sweet and patient with me. Thank you very much. I rescued a YNA, she was obviously abused, and severely neglected. It's taken months for me to gain her trust. The problem is, she only likes me. If anyone comes close to me while she's with me, she will fly to them and attack. For some reason, she hates my husband. I had to clip her wings, because she for no reason would fly to my husband and bite him, naming her beak into his flesh. Every time she sees him, her tail fans, and her neck feathers stand on end, and her eyes pin. I would like to have her interact with him, but she won't have anything to do with him. It could be maybe he looks like someone who abused her. JOJO is 10 yrs old. So in order for me to keep her, I have to cage her when he's home, cause she will jump off her cage trying to get him. Since this blog post was written I have created a really nice webinar on this topic. 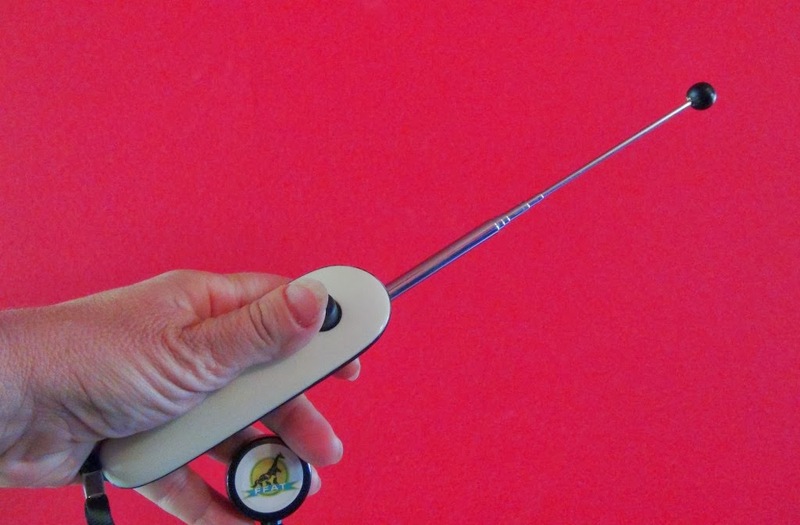 It is about two hours long and is very comprehensive with step by step instructions and video clips to help you prevent (or fix) a bird from being in a reproductive state and bonding to one person. If that is not enough to help you address the problems, there is also a webinar recording on aggressive behavior. Both can be found here https://barbarasffat.com/webinar-recordings/ Those should help get you on track. 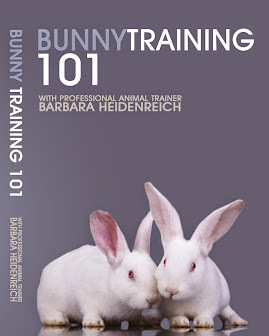 Barbara Heidenreich has been a professional in the field of animal training and behavior since 1990. She travels the world training the earth’s most unusual creatures using science based training technology. Her company Barbara's Force Free Animal Training (www.BarbarasFFAT.com) provides animal training products and services to the companion parrot, rabbit and guinea pig communities. Her products include books, videos, webinars and animal training workshops. She also provides consulting services to zoos, nature centers and other animal facilities. She is a clinical adjunct instructor at Texas A & M University. 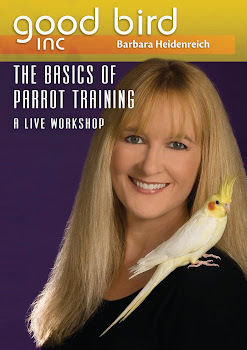 Barbara is a former president of the International Association of Avian Trainers and Educators and served on the Board of Directors from 1997-2009. In her career she has trained animals, trained staff, lectured and/or presented shows at over 40 facilities around the world. 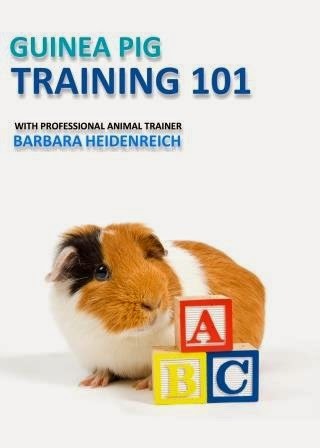 Barbara has made over 200 presentations on animal training in 20 countries. She is famous for her enthusiastic and entertaining presentations, but her true gift is her kind and gentle approach to animal training. Her goal is to leave a legacy of kindness to animals and others by sharing her expertise. Copyright 2009 © Good Bird inc.